The 2017 regular season foes will bring plenty of entertainment with them to Stan Skoczen Stadium this season as a new division vies for its first champion. The Royals are the team to beat as the season starts when the Dayton Dynamo come to town on Saturday, May 13th. This will be the first time the Dynamo has had to travel to Cleveland as it will be the Royals first home match since their triumph last summer. Another game of note will be on Friday, June 9th when FC Buffalo and their well-traveled fans visit Cleveland. For those looking for the perfect opportunity to enjoy Royals soccer for an entire weekend, in late June there will be an eventful back-to-back with Fort Pitt Regiment in Cleveland on the 23rd followed by a quick jaunt to Marimon Field in Pittsburgh for a match on the 25th. Closing out the season against FC Buffalo in the 5,000-seat capacity of Robert E. Rich All-High Stadium will be one of the Royals’ toughest tasks. The travel for The Royals fans this regular season will be light with games in Pittsburgh, Dayton, Rochester, and Erie, all within a few hours’ drive. Before NPSL conference play begins, the Royals have been invited once again to play for the U.S. Open Cup. On May 10th in Des Moines, Iowa, the first round will showcase an intense matchup of the 2016 NPSL Champions against the Des Moines Menace of the USL Premier Development League. The Menace’s 2016 season ended in their league championship tournament to the PDL’s eventual champions, the Michigan Bucks. If the Royals advance as they did in the 2016 tournament, the opportunity to play closer to home in the USOC for the Royals will come in the second round against FC Cincinnati at Nippert Stadium. The second-round matchup will be played Wednesday, May 17th. Stan Skoczen Stadium will have the rare honor of hosting one of American soccer’s most prestigious tournaments this June. The Hank Steinbrecher Cup is a matchup of reigning champions from NPSL, PDL, USASA, plus the reigning Steinbrecher Cup holder. 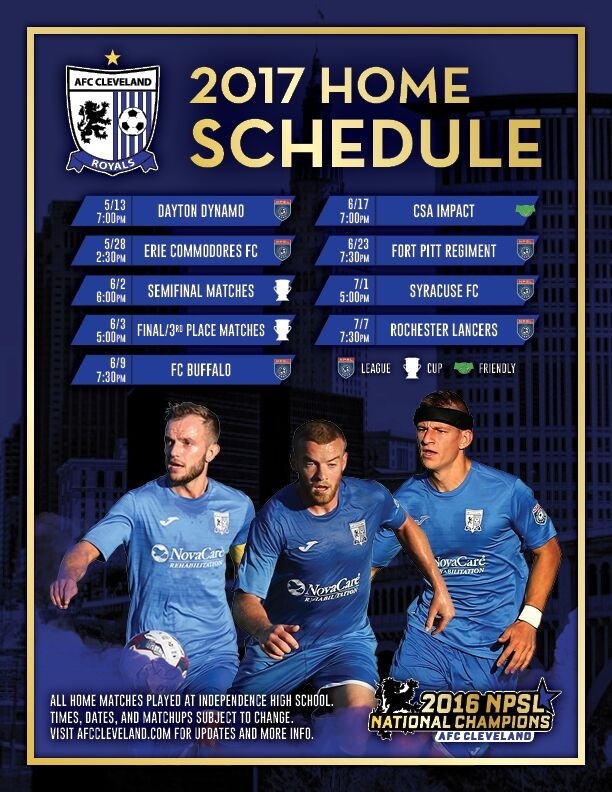 The exciting weekend of champion soccer is June 2-4 starting with the Michigan Bucks vs. FC United followed by AFC Cleveland vs. Christos FC. The opportunities of playing in the USOC and the Steinbrecher Cup, plus 18 regular season matchups, will keep the Royals busy this spring and summer. Most of the core of last year’s dream run are returning, including the team’s first-team All-NPSL selection, Potocnik, and second-team selections Long and Harter. Although most of the competition in this year’s East Conference is familiar, the only teams from 2016 with a better than .500 record are the Royals and FC Buffalo. Thanks to dominating defense and the relentless fans of the Wampus, AFC Cleveland hasn’t lost a home game in years. The competition will be tough but the reigning champions will be favorites to win the conference and enter the NPSL postseason for a third consecutive year.